We have just celebrated Memorial Day. It has been called the unofficial start of summer and often features backyard barbeques, trips to the beach, or mattress sales. It seems that many Americans give no more than a passing thought to why that day is set aside on the calendar. Memorial Day is about sacrifice. On Memorial Day we remember all those who made the ultimate sacrifice, those who gave their lives so that the rest of us may enjoy freedom. Memorial Day is the day to remember those servicemen and women who died on battlefields defending and extending freedom. 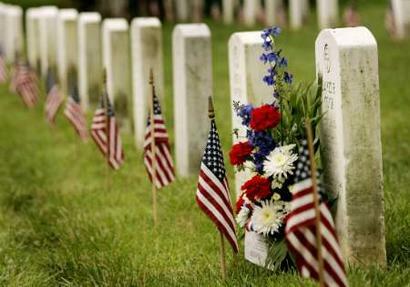 Until 1882 Memorial Day was called Decoration Day. Flowers were placed on the graves of soldiers in both the North and South. It became more widely recognized after World War I and II, and did not become an official federal holiday until 1971. The Soldiers, Sailors, Airmen, and Marines who gave their lives to defend and extend freedom are deserving of our honor. It is easy to overlook the sacrifices they made and simply enjoy the freedoms we have. We would do well to take time to consider the high price they paid and the river of tears cried by their families. We would do well to teach the next generations that freedom is not free and was purchased with the blood of our fallen sons and daughters. And we would do well to express our appreciation to the men and women who are actively serving and have served faithfully. My hope is that you both enjoy your Memorial Day weekend and that you remember and honor those who paid the price that you can enjoy it.